Try these Danish pastries to bring a slice of Denmark into your very own kitchen. Place into a preheated oven using CircoTherm, 200˚C. Cut each sheet of pastry into 4 squares. On each square cut a border 1cm wide, leaving it intact at two opposite corners. Brush the centre square with a little marmalade or jam and place 2 apricot halves diagonally in the centre positioned towards the corners which are not cut. Fold the corners of the solid square on 2 sides diagonally across the Apricots gently pressing them together to secure. Fold each of the 2 cut corners of the border so that they overlap the solid squares. Brush the pastries with the egg wash.
Place them on a baking tray lined with baking paper and begin preparation for pastry cases. If you are not cooking the cases, place danishes in oven and bake for 18 minutes or until pastry is golden. To serve, dust apricot danishes with icing sugar. Cut each sheet of pastry into 4. Cut a small strip, about 1.5cms, from each side of the square. Brush along the edges of the square with a little water and place each strip along the edges of the square, pressing gently. Remove any excess pastry. 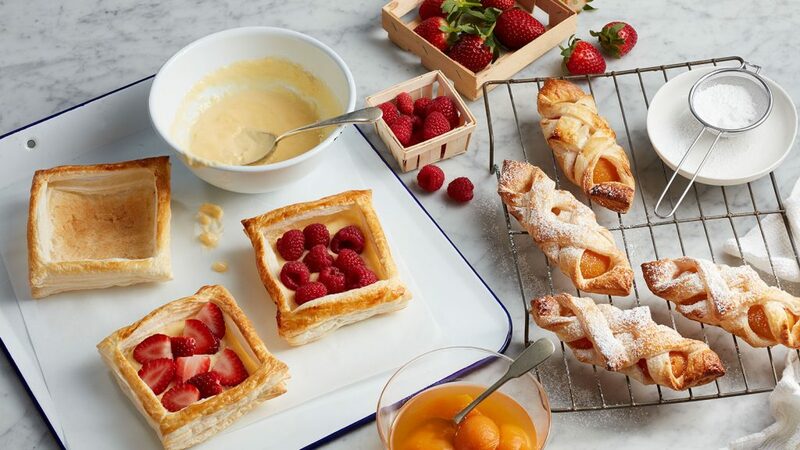 Brush pastry with egg wash and place on a baking tray. Bake for 18 minutes or until pastry is golden. To flatten the inside of the pastry case use a similar sized glass to gently press the raised surface making sure that you don’t flatten the edges, leaving a “wall” to allow for fillings. Leave to cool and fill them with your preferred fillings eg custard and fresh fruit.